Scotts® Outdoor Cleaner Plus OxiCleanTM Concentrate is great for large outdoor cleaning projects. It uses Fast-Foaming Action that starts working on contact to lift dirt and wipe out stains from Moss, Mold, Mildew and Algae and more. 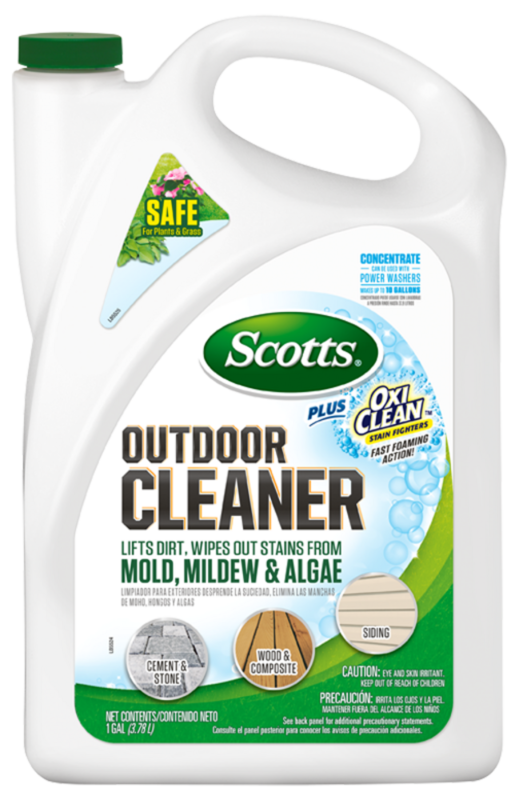 Also, Scotts® Outdoor Cleaner Plus OxiCleanTM is safe to use around lawns and plants, plus it will not damage fabrics. Even better Scotts® Outdoor Cleaner Plus OxiCleanTM can be used in Power Washers, unlike other outdoor cleaners. The outdoor cleaner is incredibly versatile and can be used on a variety of surfaces such as: concrete, wood, siding, patio furniture, outdoor fabrics, flower pots and more! Finally, the 1 Gallon Concentrate bottle is a great value making up to 10 Gallons of cleaner! Determine correct dilution rate based on amount of dirt and/or staining upon surface. Apply cleaner onto surface. Let solution set for 5 to 10 minutes. Timing will vary depending on the surface and amount of staining involved. If surface appears to be drying, then re-wet as needed prior to scrubbing. Make sure to Scrub surface clean after applying Scotts® Outdoor Cleaner Plus OxiCleanTM for best results. Rinse surface with water after scrubbing to wash away dirt and foam. Residual foaming will naturally dissolve. Please note cleaners will remove dirt & stains from moss, mold, mildew and algae, but is not designed to kill actively growing infestations such as living moss. Can be used on multiple surfaces such as: concrete/brick, wood, composite wood, vinyl, patio furniture (including outdoor fabrics), roofing shingles, fiberglass, painted metals, etc. For general cleaning and brightening, add 12 oz (1.5 cups cleaner to 108 oz (13.5 cups) of water. For heavily soiled areas, add 32 oz (4 cups) cleaner to 96 oz (12 cups) of water. Apply solution to the surface to be cleaned. Let solution set for a few minutes. For best results, scrub as needed. Lightly rinse with water. If product dries, reactivate cleaner by scrubbing with a wet brush, or lightly spray with water. Expect foaming action to continue after rinsing. Residual foaming will naturally dissolve. Refer to your power washer manual specific for chemical use instructions. Fill chemical chamber with undiluted concentrate. With LOW PRESSURE SOAP NOZZLE, apply cleaner until wet. Let solution set for a few minutes. Use high pressure nozzle to rinse surface. Foaming may continue after rinsing. Residual foaming will naturally dissolve. After cleaning, do not store cleaner in chemical chamber. Fill chemical chamber with water and flush using low pressure soap washer to prevent damage. Dilute concentrate according to directions for use. Apply cleaner solution directly to surface. Let solution set for a few minutes. Rinse area with high pressure nozzle. Foaming may continue after rinsing. Residual foaming will naturally dissolve. Poor diluted cleaner/dilute concentrate product in clean tank sprayer. Apply cleaner solution directly to surface to be cleaned. Let solution set for a few minutes. For best results, scrub as needed. Lightly rinse with water. If product dries, reactivate cleaner by scrubbing with a wet brush, or lightly spray with water. Expect foaming action to continue cleaning after rinsing. DO NOT STORE product in the tank sprayer and be sure to rinse sprayer out thoroughly after use. There is no expiration date for this product. Lifts dirt and wipes out stains from moss, mold, mildew, algae. Powerful fast-foaming action that starts working on contact. Safe to use around plants and grass.